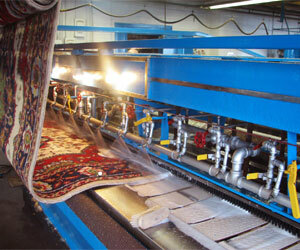 At Home Design Carpet and Rugs we pride ourselves on being industry experts. That’s why we offer a number of professional services in addition to our wide selection of products. From our professional rug and carpet cleaning to our 25 plus years of non-subcontracted installation experience, we guarantee our clients great results! All of our installation crew members are not subcontracted and have over 25 years of experience. See more about our installation services here. We can help your carpets and rugs look like new again. Refresh your current area rug with our professional area rug cleaning services today! Our cleaning team has vast experience and are the best in the business. In addition to these services carpet spot and stain spray cleaners are available in store. Come in today to find out more about keeping your rug investment looking like new for years to come! Is your rug damaged? Bring in your rug today for a free quote from our repair experts. In addition to these services we also offer carpet and rug cutting/seaming, binding (including wide binding) and surging as well as nonslip rug pads for hard and soft surfaces. We always have remnants and end of the rolls in stock at amazing prices. We are able to cater to all of your carpeting needs so Contact us today!